This coming Sunday is the Fifth Sunday in Lent (Lent 5). For those who use the historic one-year lectionary, it is called Judica, the first Latin word in the historic, one-year, lectionary. In last week’s Sunday Thoughts, I said we would be using Divine Service, second setting. If you were in the worship service Sunday, you noticed that we used Matins. That is our normal choice on fifth Sundays. 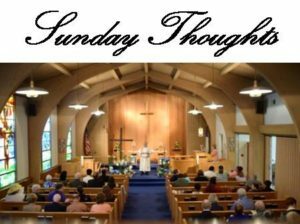 When I put the Sunday Thoughts together last Monday I failed to notice that it was a fifth Sunday. I apologize for any confusion. This coming Sunday we will be using the second setting of the common morning worship service found the Lutheran Service Book. As it is a first Sunday, we will be receiving the Lord’s Supper. Because it is the fifth Sunday in Lent, our musical responses will finally be completely eliminated. That is to say, the liturgy will be completely spoken, except for the singing of the hymns. The sermon is titled “The Cornerstone.” The sermon text is Luke 20:17. Our opening hymn is “My Song Is Love Unknown” (LSB 430). Our sermon hymn is “My Hope Is built on Nothing Less” (LSB 576). Our closing hymn is “Christ, the Life of All the Living” (LSB 420). Our distribution hymns will be “Christ Is Made the Sure Foundation” (LSB 909), “Draw Near and Take the Body of the Lord” (LSB 637), and “God Loved the World So That He Gave” (LSB 571). The appinted readings for Sunday are Isaiah 43:16–21, Philippians 3:4b–14, and Luke 20:9–20. Below are the readings along with my initial thoughs. Initial Thoughts: In looking forward to the deliverance Jesus will work in the New Testament (the “new thing” in verse 19) the Lord begins with the greatest deliverance he worked for his Old Testament people, their deliverance from Egypt and his guidance through the wilderness. This deliverance also established the Lord as their true God, the one who “formed them” (verse 21). Isaiah uses wilderness images as a shadow of New Testament realities. The “wild beasts,” “jackals” and “ostriches” represent the gentile nations. The wilderness is the world. The water is the water of life, faith in Jesus. The “way” God makes is the way of the cross of Jesus. These gentiles are added to the faithful Jews, who then form, together, the chosen people of God. So the “formed” people of God are from all races, all who have been chosen by God and they all join together in praising the Lord. 4… If anyone else thinks he has reason for confidence in the flesh, I have more: 5circumcised on the eighth day, of the people of Israel, of the tribe of Benjamin, a Hebrew of Hebrews; as to the law, a Pharisee; 6as to zeal, a persecutor of the church; as to righteousness under the law, blameless. 7But whatever gain I had, I counted as loss for the sake of Christ. 8Indeed, I count everything as loss because of the surpassing worth of knowing Christ Jesus my Lord. For his sake I have suffered the loss of all things and count them as rubbish, in order that I may gain Christ 9and be found in him, not having a righteousness of my own that comes from the law, but that which comes through faith in Christ, the righteousness from God that depends on faith— 10that I may know him and the power of his resurrection, and may share his sufferings, becoming like him in his death, 11that by any means possible I may attain the resurrection from the dead. 12 Not that I have already obtained this or am already perfect, but I press on to make it my own, because Christ Jesus has made me his own. 13Brothers, I do not consider that I have made it my own. But one thing I do: forgetting what lies behind and straining forward to what lies ahead, 14I press on toward the goal for the prize of the upward call of God in Christ Jesus. Initial Thoughts: Paul is emphatic here. Salvation is not by good works but by grace. He lists many things he did that are considered “good works” and calls them “rubbish.” Righteousness before God is not accomplished by such efforts. Righteousness before God is found in Christ Jesus, our Lord. Verses 12 through 14 are important for us to remember. While righteousness is indeed a gift, it does not mean that our Christian lives are to be lazy and inactive in good works. We walk in the way of Christ, pressing forward to our heavenly goal. 19 The scribes and the chief priests sought to lay hands on him at that very hour, for they perceived that he had told this parable against them, but they feared the people. 20So they watched him and sent spies, who pretended to be sincere, that they might catch him in something he said, so as to deliver him up to the authority and jurisdiction of the governor. Initial Thoughts: The biggest danger in reading this lesson is to assume it is ONLY about the first century Jewish leadership, or Jews in general. Certainly the leadership of the Jewish people in the first century is intended, as they correctly understood, but it applies more broadly. Anyone one who rejects Christ as the cornerstone has that cornerstone fall on them and is crushed by it. This is an especially stern warning for leaders in the visible Church, though it applies to all who bear the precious name “Christian.” Whether in the first century, or today, salvation is found only in Jesus. Those who depend on their own works for salvation will hear Jesus say on the Last Day, “I never knew you; depart from me, you workers of lawlessness” (Matthew 7:23). Those who trust in Jesus and walk in his way hear a much different message on the Last Day, “Well done, good and faithful servant. You have been faithful over a little; I will set you over much. Enter into the joy of your master” (Matthew 25:21). To say the same thing using the image set up by Saint Paul in our epistle lesson, those who receive the righteousness of Christ and press toward the goal for the prize of the upward call of God in Christ Jesus, will not be disappointed.